The air battle in the Kuban. Mounted in a few episodes of the composition, which gives an idea of ​​the air battle during the Second World War. The photo shows Soviet MiG-3 and Yak-9 fighters, one downed German Junkers Ju-88 bomber. If you look closely, above and to the left can be seen the last point – it is three combat aircraft. 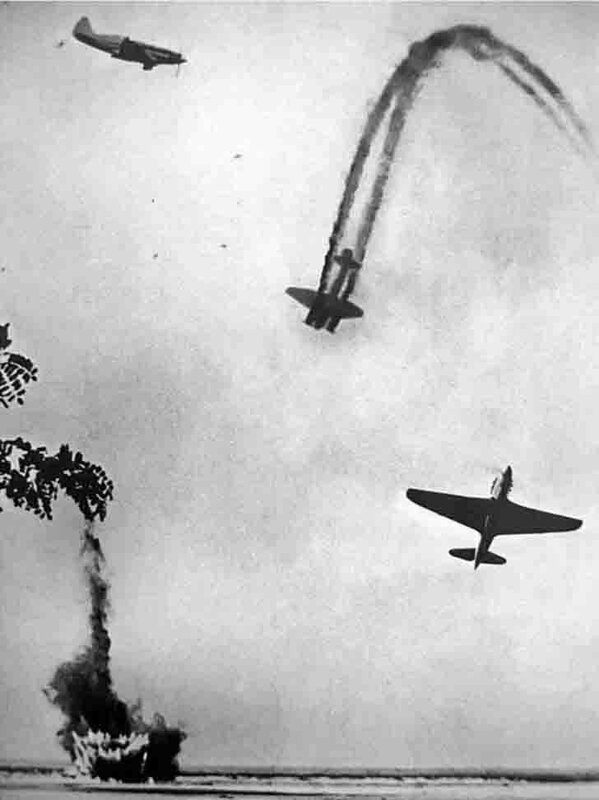 The air battle in the Kuban – a series of large-scale battles against the Soviet Air Force Luftwaffe in April – June 1943 over the River Kuban and Taman Peninsula and Novorossiysk during the Great Patriotic War, in order to capture the strategic air supremacy over bridgehead of German troops in the Kuban. In Soviet historiography considered as part of the Battle of the Caucasus.